Once March rolls around I start thinking about Spring projects and even though warm weather is still a while away, and we still have a lot of snow on the ground, I’m dreaming about being out on the back deck watching the birds and listening to silverware wind chimes playing their lovely music in the spring breeze. 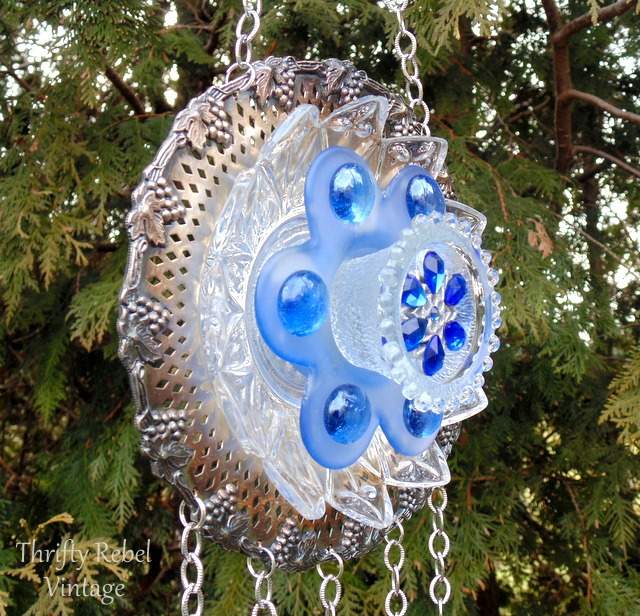 I love to make garden art, and I decided to combine two of my project loves into one to make a garden plate flower wind chime. 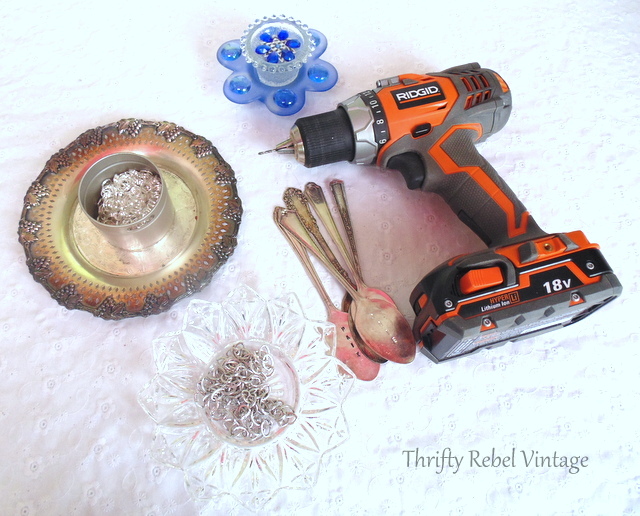 The blue glass candle holder piece is from another project that I took apart years ago. 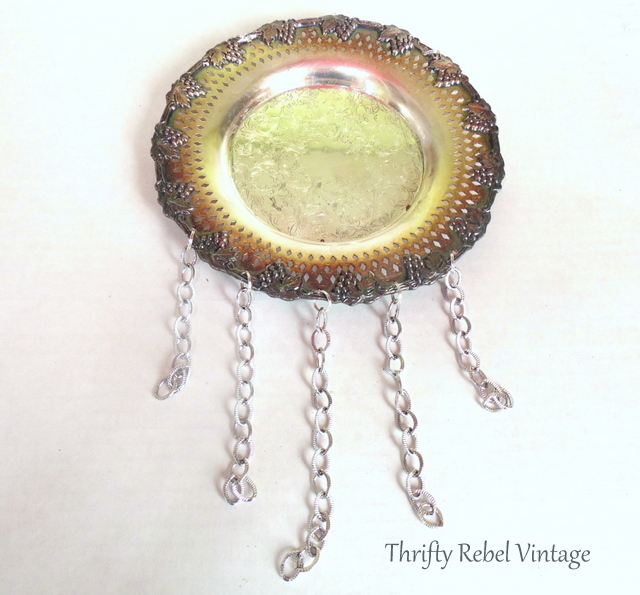 It’s decorated with blue glass beads, and the clear glass candle holder that’s glued inside it has an earring glued in its centre. The first thing I did was figure out where I wanted my spoons to hang. 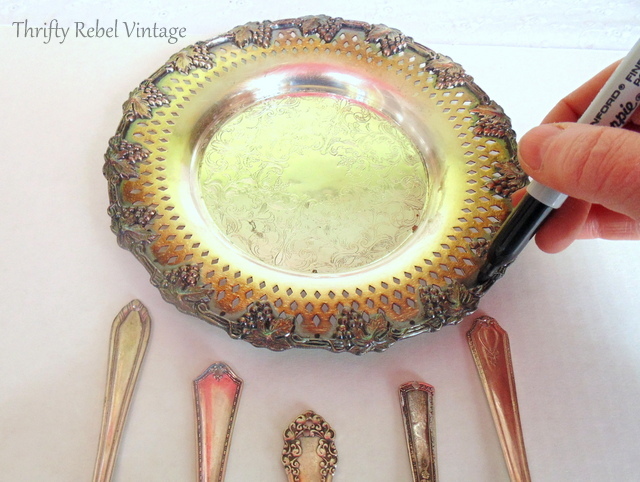 I lined them up with the silver tray and marked where I wanted my holes to be with a sharpie. Using a 3/32″ drill bit specifically for metal I drilled my holes. Then I threaded on my split rings. 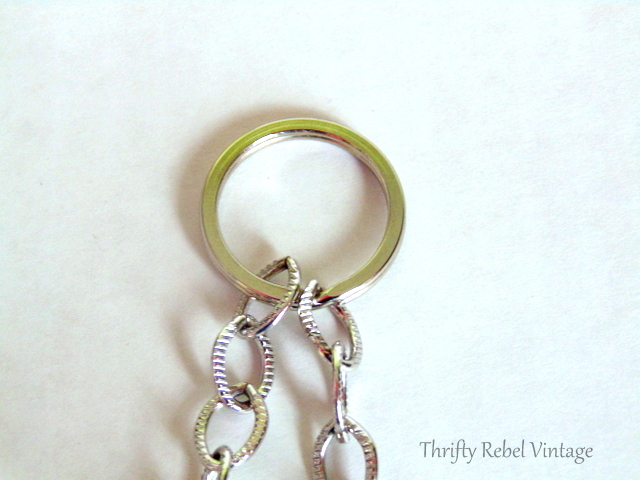 Once the split rings are attached to the tray the chains are then threaded onto the split rings. And split rings are added to the holes at the tops of the spoons. 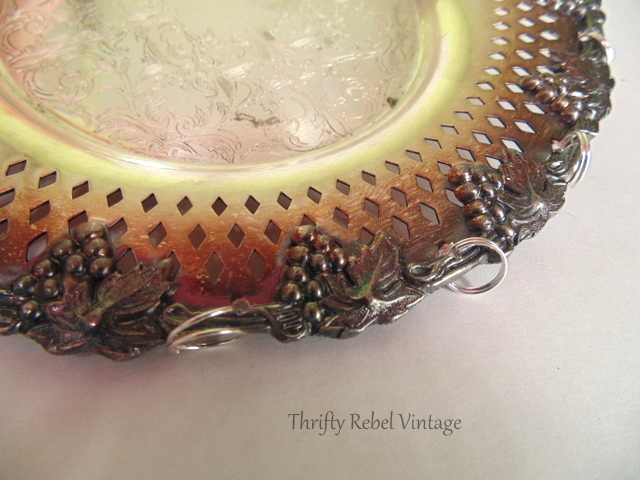 The holes are drilled into the silver plates spoons the same way as the tray. Two lengths of the same chain are used as hangers at the top of the chime. They’re both threaded onto a key ring. ow that the wind chime part is done it’s time to glue the plate flower pieces together. 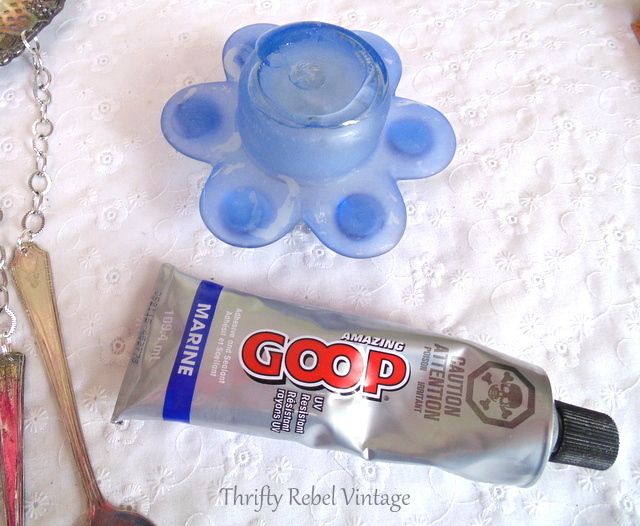 I use Marine GOOP adhesive for most of my outdoor projects. It’s used in boat repair and is UV and water resistant. You can see the glue on the bottom of the blue candle holder. The trick is to not use too much, and to kinda swivel pieces a bit to make sure that the two pieces actually come into contact. 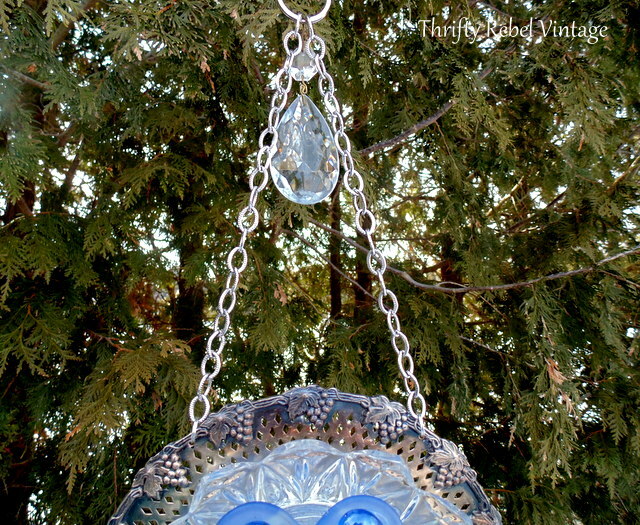 I add a glass chandelier crystal to the top of every wind chime I make. You should wait at least good 24 hours before hanging it outside permanently. 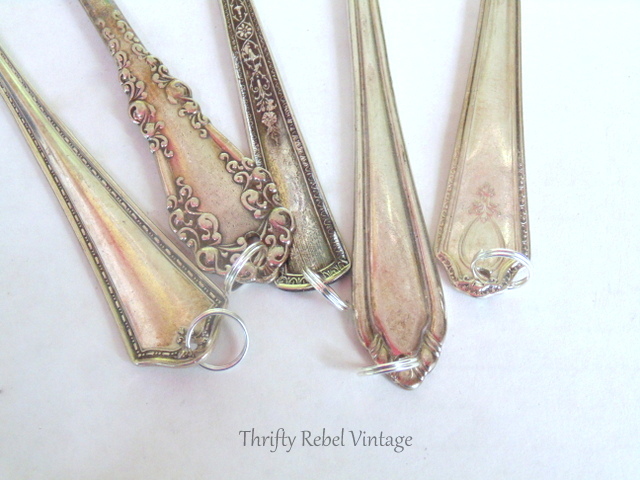 I already had these hand metal stamped spoons on hand, but the spoons don’t have to be stamped at all. 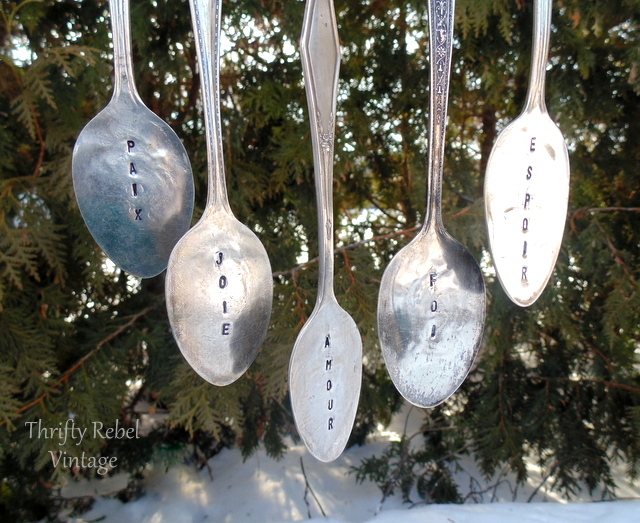 My spoons, from left to right, read peace, joy, love, faith, and hope in french. 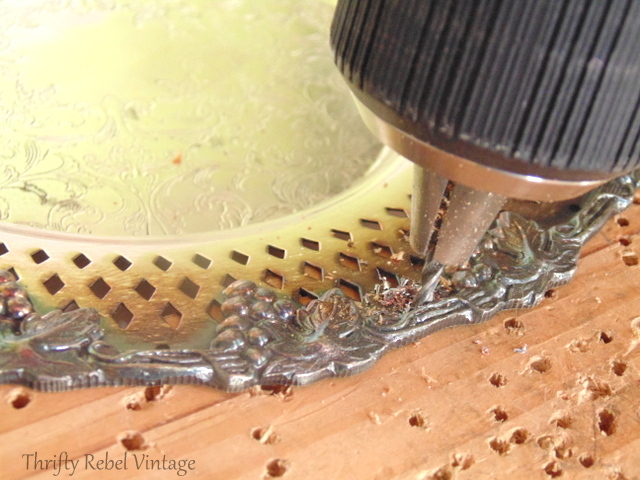 To see a tutorial on how to flatten, drill, and hand stamp silverware see my Hand Stamped Silverware Bookmark. It can hang high up on a deck or a porch like a wind chime, or from a shepherd’s hook right in the garden like a plate flower. Either way you will enjoy the lovely music of the silverware chimes. 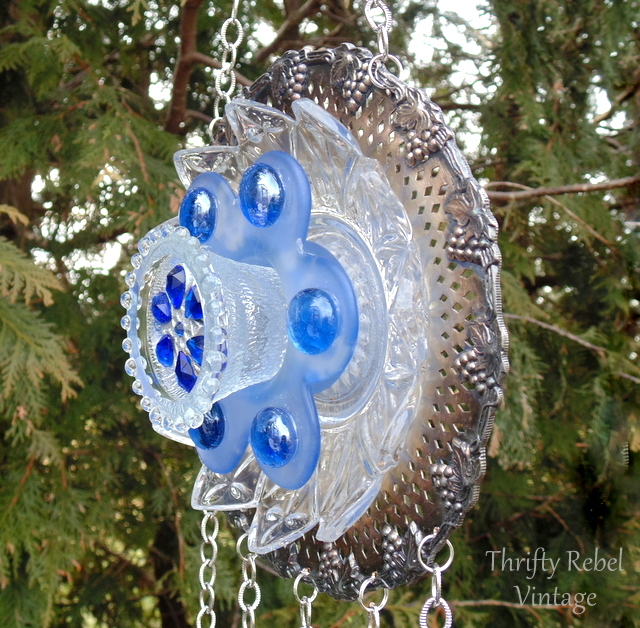 And here’s my finished garden plate flower wind chime. I’m so glad to have my first wind chime of this season under my belt, and it’s not even officially spring yet. This has inspired me to get my garden art groove on a little earlier this year. 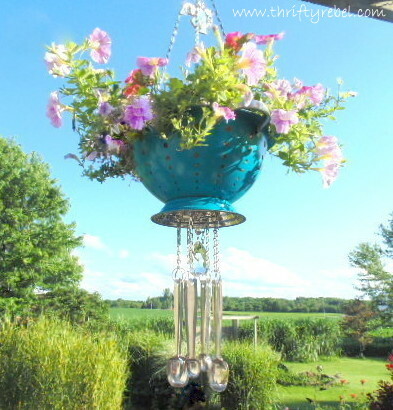 If you enjoyed this garden plate flower wind chime project, I think you’ll like this strainer planter wind chime. 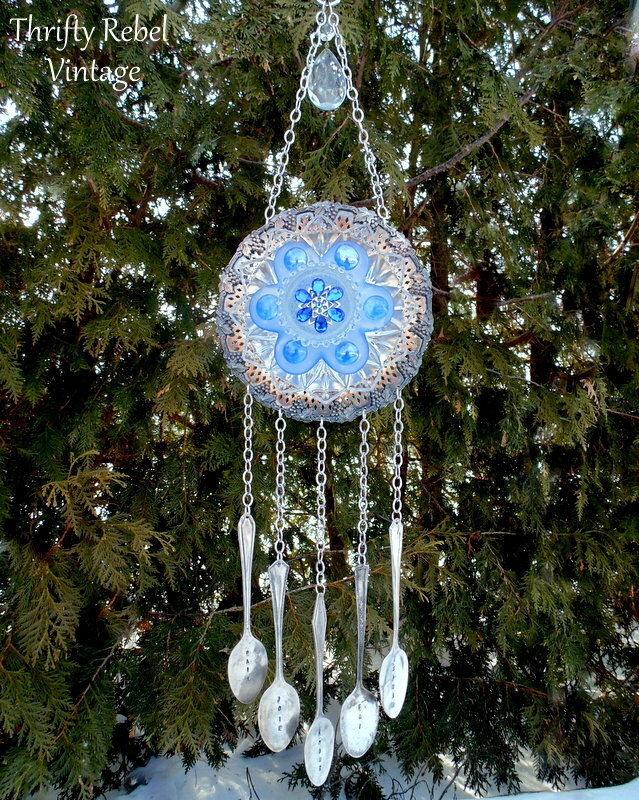 What a pretty wind chime!!! Love it Tuula! Your chimes are so unique! Thanks Cecilia! I really enjoyed making them. I had a wind chime like this when I got married 38 years ago. I gave it to the thrift store. Little did I know what I was giving up! Thank you for inspiring me to make another one. I hope you do make another one Meegan. There’s nothing like the sound of silverware chimes. So pretty! Fabulous! So pretty & so creative! That turned out so pretty! I love the stamped silverware too. It would be fun to do some that say spring, summer, winter, fall. Thanks Tania! That sounds like a fun idea! Just beautiful, like all your others! 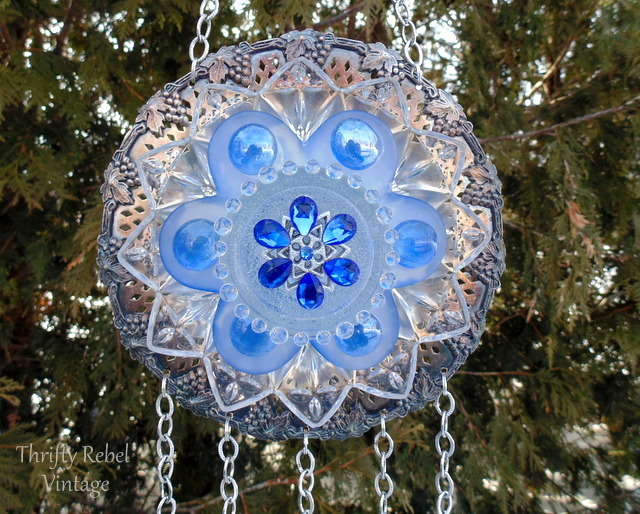 I made one for myself for the garden in…..aqua! Can’t wait for the weather to change to us all my garden art. Thanks AnnMarie! That sounds lovely. I really can’t wait for spring either. We’re in a bit of a warm spell right now and all the snow is melting. Yay! This is too cute! I LOVE the blue. Great job. Thank you so much Sara! It was a fun project! I bet it sounds as beautiful as it looks. Thanks Donna! It sounds heavenly, if I do say so myself. There’s really nothing like the sound of silverware chimes. Thanks Michele! I hope my tutorial is of some help. It can take a little practice to get the hang of stamping the spoons. Also, I hope you’re using silver or silver plate spoons… stainless steel is pretty much impossible to stamp. I’ve tried. lol. Love the spoons hanging down. I bet it catches the light as well as chimes. Brilliant upcycle. Thanks you so much Handan! Ohhh Tuula, if you have only heard me mutter, “Oh my gosh, this is so gorgeous” the entire time I’ve been scrolling. I need this in my life! 🙂 Clever and beautiful. I’d bet it sounds amazing! Thanks so much Donna! They do sound pretty great. There’s nothing like silverware chimes. You should definitely make some for yourself. I have a couple of these chimes on my back deck and we enjoy listening to their music them from spring to fall. Tuula, you hit this on out of the park!!! Gorgeous! Thanks so much Christina! They do sound heavenly. Once you’ve made one I know you’ll enjoy it for years to come. Is there a place I can ask you a question about another, same type project? Thanks Shan! You can email me using the email address that is on my contact page. Click on About TRV in the menu bar below my header. I don’t type my email address in comments because spammers can pick it up that way.